Before I write any advice type post I always feel like I need to sense-check myself and make sure I really feel I have the experience/knowledge to ‘entitle’ me to be sharing my own ‘wisdom’ on whatever topic it is. For this, I have the grand total of ONE holiday with a baby under my belt. So please take the following tips with this in mind – but I do however feel like I’ve learnt a bit that I can share to hopefully help other parents tackle that first holiday as stress-free as possible. I hate packing. The only thing I hate more than packing is unpacking. I know it’s something I need to do, but I will procrastinate to the last moment and try to delay the inevitable. There’s no avoiding it. It has to happen and where before as much as I dislike the process, I had gotten pretty good at packing for myself and could do so with minimal time and stress. Packing for baby PLUS yourself. Whole different ball game. Asking myself endless questions including the ‘so how many muslin cloths do I need for a week?’ (Correct answer would be an infinite amount). We brought our baby monitor with us on holiday so when she does sleep in the room we can be on the terrace relaxing ourselves. Rather than cooped up in the same dark/cool room. Although there’s also a strong argument in favour of napping when the baby naps on holiday too. I do love a nap. One of the trickiest things to navigate is the who is ‘on duty’ for baby juggle. This will be different for each couple I’m sure and it’s still something we’re working on. As I naturally tend to be happier in the shade I ended up doing most of the baby care. But that’s not to say I didn’t want a break myself a bit. So working out something that’s fair all around is tricky, but important. I know that sounds like the most obvious thing in the world. 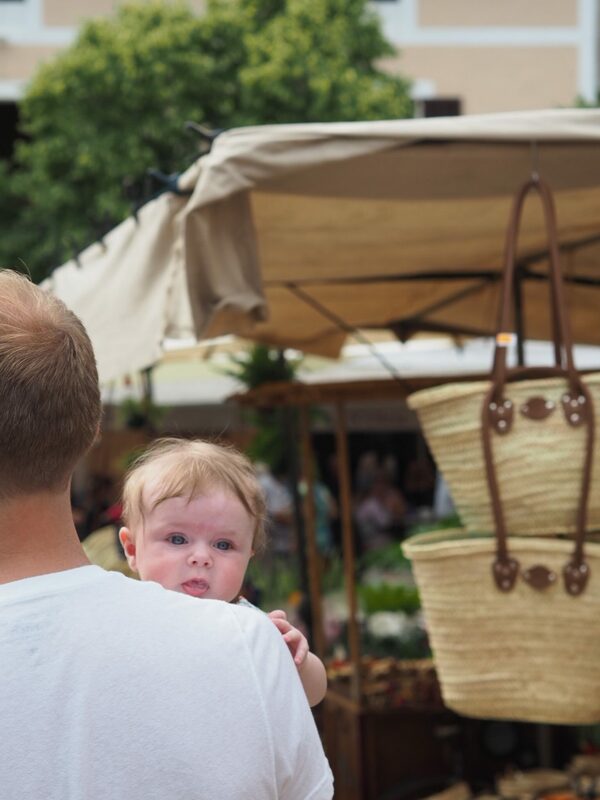 But I found that on our holiday, the only time she was fussy/had meltdowns was down to being too hot. So we did little things to help keep her cool that without a baby with us we wouldn’t have thought of in the same way. Most of which will sound totally obvious, I know. But I found it a bit of a ‘switch in thinking’ when in holiday mode. Sitting near a fan, in shade when outside. Opting for air con space inside if it’s really hot. Keeping baby shaded but not totally covered in pram (things like snooze shade which are perfect usually can leave the pram as a little pocket of increasingly hot air). So I used a light large muslin and clipped it over the pram so blocked sun but still open for air to flow. I also had a little La Roche-Posay Thermal Spring water spray that I kept in the baby bag for ’emergency’ cool down type situations as it really did help as even without any type of cover on the pram would get really hot and stuffy but a little mist of that and she seemed much more comfortable. Now this is VERY much a subjective one and I totally appreciate that. 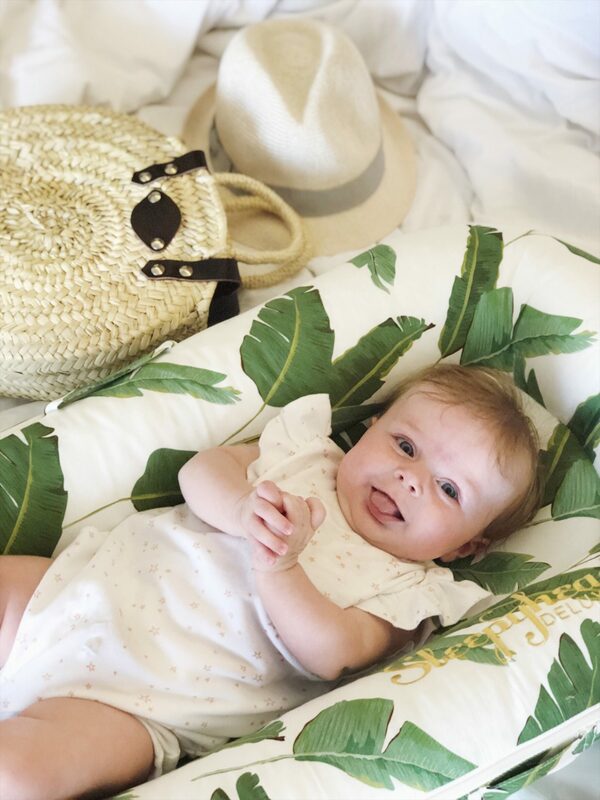 However, if you’re planning to travel often with a little one it can really be worth investing in travel friendly items to help the A-B process run as smoothly as possible. 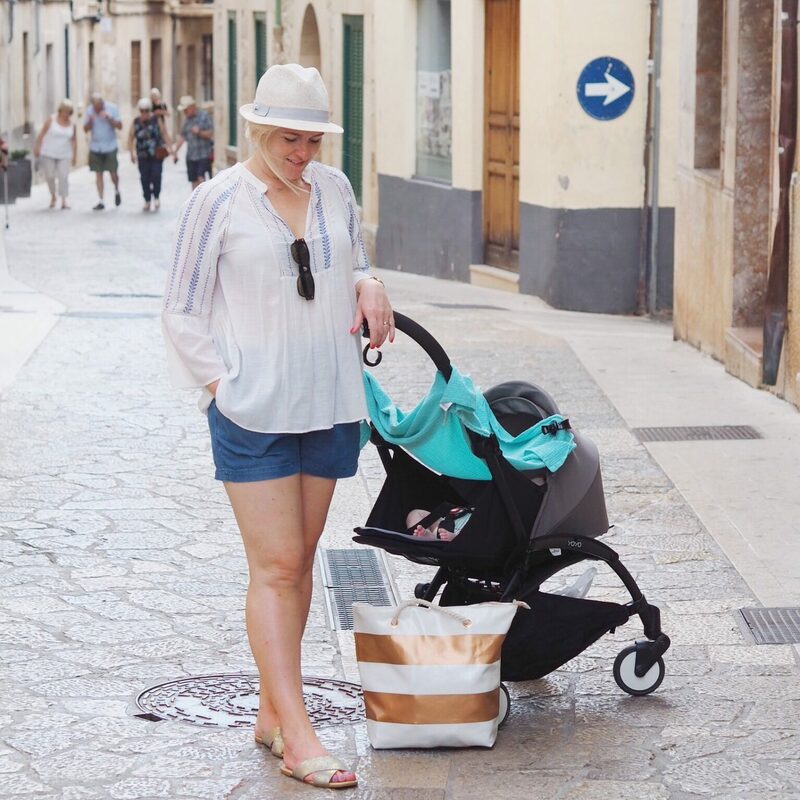 The number one best purchase we made for our holiday – and it was a big one – was the BabyZen YoYo Pram. Much loved by city-living mums and any one travelling with tots. I can 100% see why. The thing is a design wonder – SO small and lightweight. It folds down to cabin bag sized so both flights we were allowed to take it all the way on to the plane with us. Which made the airport process as smooth as can be. 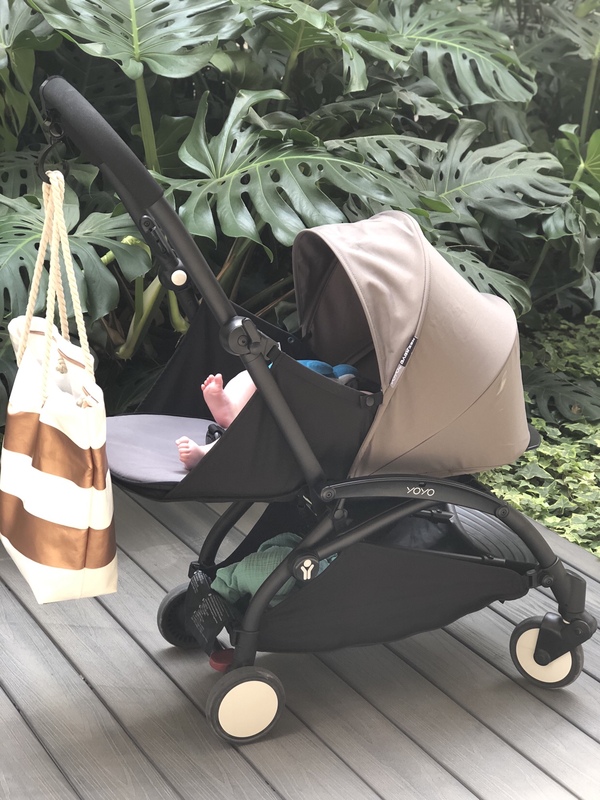 The pram is up there as one of the best purchases we have made for baby and would really recommend it if you want something small, light and folds down to a tiny tiny size. The same can apply for things like travel friendly toys. I bought Ella an inflatable toy that doubled up as a seat and play-arch – it worked a treat as a place for her to sit so she could see. Plus space to play. But was easy to move around & carry in the case too. We took a few bits that we probably could have coped without but made all the difference in terms of keeping her settled and with some familiar items. Especially the Sleepyhead – which I definitely think helped her to snooze well most nights. Along with a few toys and a light blanket from home and her 0.5 tog sleeping bag. A few familiar every day items are worth taking even if a bit bulky! Ok, so a bit of an all rounder tip. But if you want to travel with a baby and worried how it might go. Just go for it. If the baby has a meltdown on the plane you already know you will just do your best to comfort them as quickly as you can. Ella had a good scream on both flights, I just did what I could to calm her and she did settle. In the moment of meltdown it’s horrid. But I just figured I’m doing my best to calm her. Everyone around me was understanding. Anyone with kids had sympathy, anyone else just knew I was trying to settle her. It is what it is. Where you can, having a baby doesn’t have to hold you have from almost anything (sure, there are limits and once school age comes around it’s a new ballgame… ) but until then. I really don’t want having Eleanor to stop us from doing anything I would have done otherwise. Now, once I’ve done my first holiday with baby I feel a lot more confident doing it all over again. I’d even look at travelling alone with her if the opportunity arose. Though no doubt doing it as a family would be a hell of a lot easier.